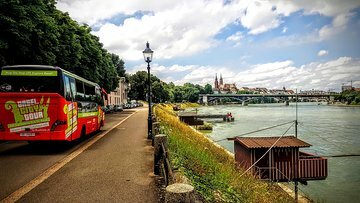 See the sights of Basel by City Sightseeing bus, and hop on and off around town to visit the landmarks, museums, and attractions that interest you most. The perfect way to sightsee at your own pace, the bus tour follows a route around the city center, passing the Kaserne Cultural Centre, the Roche Tower, and even the Stücki Shoppingcenter. You’ll learn about each site from the audio commentary as you ride around town. This was an enjoyable, comfortable tour . Basel is a beautiful City. My travel companion left her purse on the bus and we were able to retrieve it when the dricver was finished for the day. How thankful and pleased in his effort to get the purse back to her.